Hard stops… always. NEVER be in the market without a hard stop somewhere. What if you have a heart attack right after entry and get taken off to hospital, unable to close out your position for a few days? So… you had a loss, hey! I assume it was a 1R loss??? The trade was not stupid. The trade was not the problem. The stop out was not the problem. What was a problem is the way you let it affect your mindset following the trade. Why did you not seek re-entry? Why did you not look for the next trade opportunity. It's a 1R trade loss!!!!!! Are you perhaps trading with too much size? (1) You have to expect imperfection in your trading decisions and actions. And work out how to profit despite this imperfection. Things won't always work out. If you had a soft stop maybe 10 cents below the swing low, for example, I guarantee there will be times the market will move those 10 cents convincing you to scratch the trade before then reversing again and moving to profit without you. In fact… no matter how far away you set the stop, there will be times the market takes it out right to the cent. And the further away the stop… the greater the loss! We are imperfect creatures attempting to operate in an environment of uncertainty. Expect imperfection. And work to profit despite that imperfection. (2) If you want to use mental stops, then at least make sure you have a hard stop in the system WELL AWAY from current price action and beyond your mental stop location. This is an "emergency stop" that simply caters for those once a decade or even once a trading career problems that might suddenly leave you unable to exit the trade. At least you can be sure that the broker will close your position before complete financial ruin. (3) The thing with tight stops is that you absolutely have to be comfortable taking a loss and then re-entering if the premise is still valid. Many people struggle with re-entry. The only way you'll find out whether or not it suits your personality is through trial and error. I will say though that it gets easier with experience. And that it gets easier if position sizing is small enough such that a 1R stop out causes no great stress. Again… consider the suitability of your position sizing. (4) My intent was not to make fun of this trader who thought his trade was stupid. Rather, I've shared this simply because it contains some great lessons. We all go through these exact same situations where we feel stupid for less than perfect trade outcomes. It takes time in the markets to REALLY GET the fact that this is a normal part of trading. No matter where we put our stop, whether hard or soft, the market will at times move just far enough to trigger it. What is important to remember is the fact that the aim of our trading business is not to necessarily profit on any one particular trade. Rather, we aim to profit over a SERIES of trades. If you take a 1R loss… fine. That's part of the game. Move on to the next trade. It's coming along soon and it needs your complete focus. (5) The trade was definitely not stupid! Re-entry would have led to an awesome trade. Sometimes a good trade takes two attempts to get into a position. Frankly speaking, I am not a beginner but each time I study your posts, I learn something really valuable and/or at least I get a precious reminder. I pray for you and hope you continue to write and long live. Came across this site accidently..i found it very informative, and adapted ideas into stock trading on its own, eg monthly swing trading..also an AUSSIE behind the wheel.. great…so much one can learn..from here..i love the ebooks, freebies..wow..i hope you get into stock trading, too, an article or too..now I get back too learning Candlestics.. Thanks so much for your kind words. I’m glad you’ve enjoyed my writing & I’ve been able to offer something of value. I can’t see myself getting back into stock trading. But most of what I talk about should still be relevant in the equities world. I expect it would transfer across quite nicely! 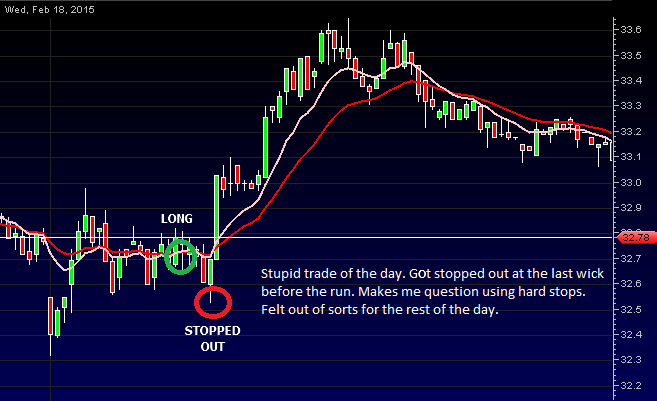 sometimes a good trades needs 2 entries. good one. I had this happen yesterday with the DAX. was short but got stopped out even with a very long stop. my Question is: It looks to me that the spikes are picking up. I mean I get more and more stopped out on spikes then ever before on the dax before entering my direction. and yes……………. I get out of hum from it. still not good enough with my mental attitude I guess. thanx for everything coach. The ONLY constant in the markets is change. Volatility will always be changing. Choppiness will always be changing. It’s our job to recognise the change and adapt.